Our Childs Elven Tunic is suitable attire for archers and swordfighters who make their home in an enchanted woodland. This long-sleeve tunic goes with a variety of looks, perfect for the roleplay wardrobe of a young adventurer. 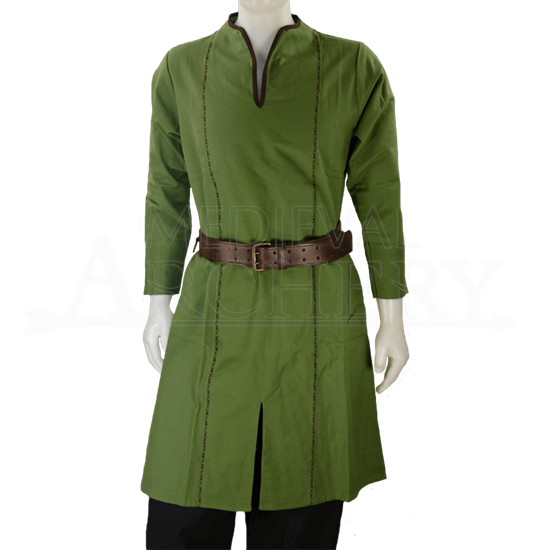 The tunic features a design inspired by the Elven warriors of medieval fantasy lore. Two lines of embroidered stitching run down the front and back of the knee length tunic. Matching trim accents the v-shaped neckline. An A-cut appears at the front of the hem. Your child will enjoy creating a unique costume with this versatile piece. The Ready for Battle Cape and the Childs Medieval Ring Belt are among the many accessories that go great with the Childs Elven Tunic. Please be aware that as a hand-made item, the color on this garment can vary slightly from what is shown.